How can a large business problem be solved without having to build a standalone body of solution logic? To solve a large, complex business problem a corresponding amount of solution logic needs to be created, resulting in a selfcontained application with traditional governance and reusability constraints. The large business problem can be broken down into a set of smaller, related problems, allowing the required solution logic to also be decomposed into a corresponding set of smaller, related solution logic units. Depending on the nature of the large problem, a serviceoriented analysis process can be created to cleanly deconstruct it into smaller problems. The ownership of multiple smaller programs can result in increased design complexity and governance challenges. Distributed computing is based on an approach where a large problem is decomposed and its corresponding solution logic is distributed across individual solution logic units. 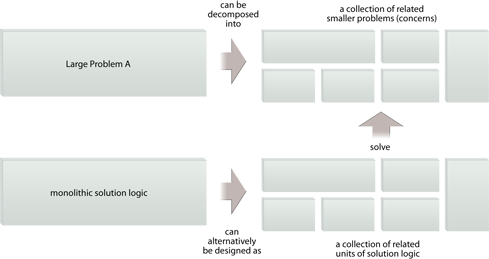 On its own, this pattern results in the decomposition of the larger problem into smaller problems, as shown in the top part of this figure. The actual definition of solution logic units occurs through the application of subsequent patterns in this chapter.